I have really been into Washi Tape projects lately, there are so many different uses for this pretty little tape! Today, I have an easy Washi Tape Easter Egg Garland tutorial to share with you. I hope you enjoy! First, I put together a Printable page of Eggs, you can find it and print your own over HERE. I printed out two pages and had enough eggs to go across the top of my bulletin board. Next, I put different colors of Washi Tape across the egg patterns that I made. Then just cut them out so I had several different eggs with different patterns. If you don’t have Washi Tape on hand, this could be a project for the kids! Have them color and make beautiful creations! After that I hot glued my eggs (back side) to a piece of bakers twine but you could use any type of ribbon or string that you have. This was a very easy project that you can even have your kids join in on, it only takes a few minutes from start to finish and is very cute when you are done. You can find the Easter Bunny Printable over at Eighteen 25. If you are looking for other Washi Tape projects be sure to stop by and check out my easy Washi Tape Note Cards. 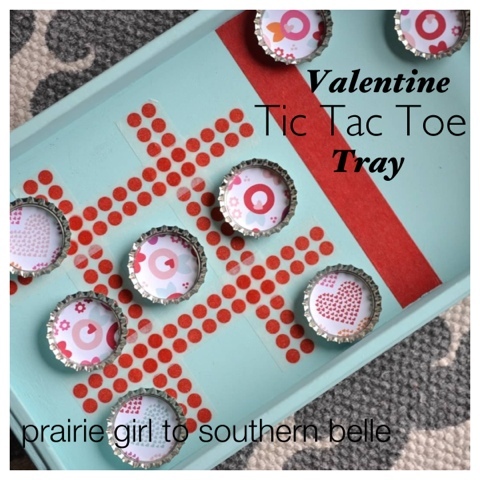 Or the Washi Tape Tic Tac Toe Tray that could be customized for any holiday. Super cute Chrissy! Pinned and featuring tonight! Adorable! Isn’t washi tape great? This is so cute, Chrissy! I think this might be my first project with the new Washi tape I ordered yesterday. I love this! What a great craft project to let the kids join in. Will definitely do it this year. Super cute! And definitely a fun project to get the kiddos to help with! Cute, cute, cute! I am just now getting into the “wash tape” groove, but it isn’t easy to find in my area for some reason, but I keep looking for it! What a cute idea! My daughter has been itching to do a spring craft and this will be perfect to do with her after school! Super CUTE!! And easy! Think it’s time to pick up some Washi tape!